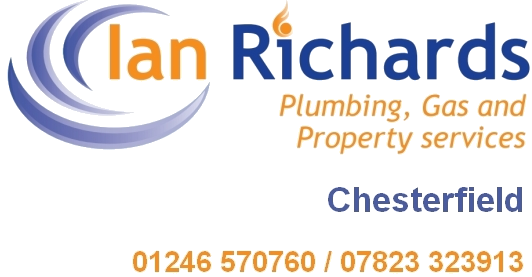 Ian Richards Plumbing, Gas and Property Services. For cost effective Heating and Plumbing, contact Ian Richards Plumbing, Gas and property Services. We keep the overheads low and pass the savings on to you, the customer. Operating from Chesterfield, we cover all the towns within a 20 mile radius, including Tupton, Sheffield, Worksop, Dronfield, Sutton in Ashfield, Mansfield, Bakewell, and Matlock.We offer all aspects of heating and plumbing services, from new tap washers through to bathroom design to completion. Ian is a second generation plumber, with more than 10 years’ experience in the plumbing and gas industry. We are Gas Safe Registered, Number 524449. When you are having any work done in your home, the engineer that does that work should be Gas Safe Registered. Our Gas Safe Registration, coupled with Part P electrical qualification means that we have the necessary training to help protect you and your family and you can be certain that any work carried out in your home will always be professionally executed. We never compromise on the quality of the work. We pay great attention to detail, with free consultation and advice for professional design and installation. Our main speciality is in delivering bathrooms, wet rooms, steam rooms and spa solutions. Your bathroom is the place where you can relax and escape from the world, so why not make sure that your new bathroom design is the one of your dreams? Whether you are looking for a contemporary space, a traditional bathroom, or the hottest current trends in design and function, when it comes to bathrooms, Ian Richards Plumbing, Gas and Property Services is your first choice to realise this dream. We have developed a relationship with all of our customers and much of our work comes through recommendation and repeat business. References are available on request. We think that part of our role is to listen very carefully to what you want, then we do everything in our power to achieve that. Call us today on 07823 323913 / 01246 570760 for a friendly chat or a no obligation quotation. Alternatively send us an email via the contacts page. Central Heating in Chesterfield, Ian Richards Plumbing, Gas and Property Services © 2015. All Rights Reserved.